This collection documents and aggregates information related to the "Occupy Movement" starting in the Autumn of 2011 and continuing in 2012. In September of 2011, a demonstration was held in New York City, calling itself "Occupy Wall Street". This demonstration inspired similar protests and demonstrations around the world calling for social and economic equality, which are collectively now referred to as the "Occupy Movement". We protect your personal information and privacy. Read our commitment to privacy. Tami lost 188 pounds using MyFitnessPal! MyFitnessPal is a diet and fitness community built with one purpose in mind: providing you with the tools and support you need to achieve your weight loss goals. 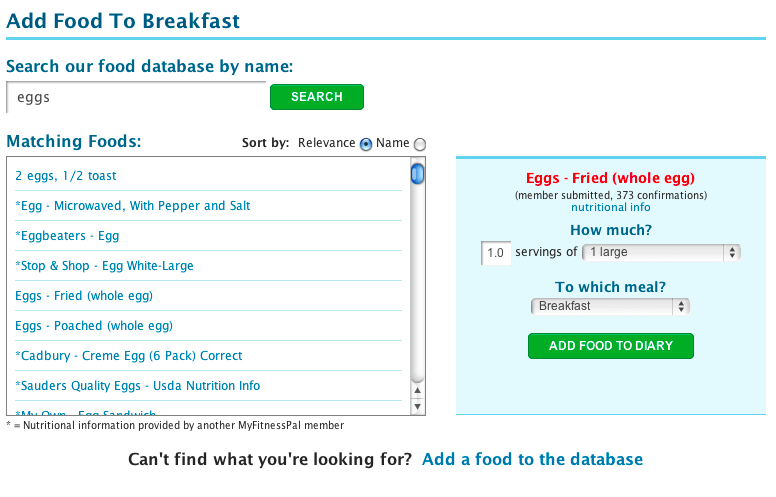 Get FREE access to the world's largest nutrition and calorie database — over 1 million foods! We believe — and medical studies prove — that the best way to lose weight and keep it off forever is to simply keep track of the foods you eat. Gimmicky machines and fad diets don't work, so we designed a free website and mobile apps that make calorie counting and food tracking easy. MFP has been instrumental to my weight loss. I've tried countless times to lose weight but nothing worked. Anything restrictive and I would just gain the weight right back. But MyFitnessPal really works. 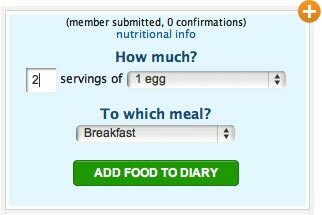 MFP makes counting calories SO easy. I log onto my iPhone app every day and I'm proud to say I haven't missed a single day of logging in. The community aspect on this site is amazing and I've made some really great friends throughout this journey. I can't wait to continue losing weight with MFP! My trainer recommended MyFitnessPal to me, but I was concerned that is would be too time consuming and difficult to use...But it's easy! After a few days, it's just a couple of clicks and you're done! If you're serious about fitness or weight loss or eating better, MFP is an excellent way to keep you in check and on track. Frankly, I thought that MyFitnessPal would not work. I figured it would start out free and once I was hooked, there would be a price involved...but that has not happened — free really means free. With a few clicks throughout the day, you are able to monitor your calorie intake, set goals and ultimately, see the scale trend down. MyFitnessPal has made a tremendous difference in my life! I love the vast database of food. The huge food database makes it almost impossible to NOT find a food that you're eating. The recipe counter makes it so much easier to track the nutrition in homemade meals and the exercise tracker lets me see the amount of calories I've worked off for the day. With MyFitnessPal's help, I've lost 75 lbs and I'm still going! I feel like a whole new woman! Use our FREE mobile apps and track from anywhere, anytime. In one of the longest running and largest weight loss studies ever conducted, Dr. Jack Hollis found that simply writing down the foods you eat encourages you to consume fewer calories, and that's the key to losing weight. You don't need expensive gym equipment or memberships to lose weight - you just need to keep track of what you eat. MyFitnessPal saves you the trouble of carrying around a notepad and pen to track your calories. 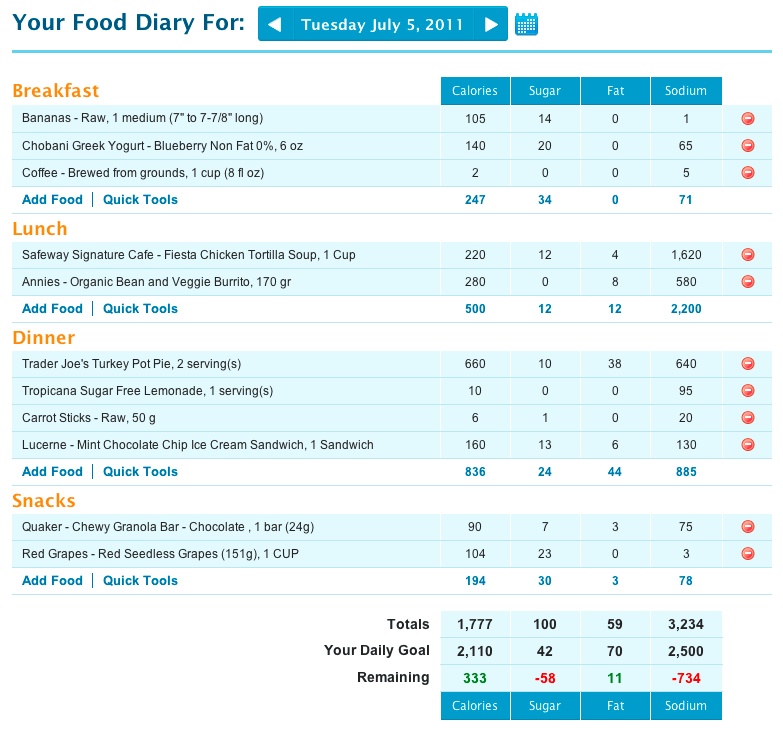 Log your foods on our website or mobile apps, and your calories are seamlessly synced between them. There's no math to do - we add everything up for you and keep track of how many calories you have left. I love the 'community' aspect of the site, where knowledge and tips can be exchanged and there is always support or advice available from someone who can understand how I am feeling or what might be frustrating me. My fitnesspal has taught me so much. This site is a godsend. It has taught me how to eat things in moderation. It has taught me that I don't have to eat "salads" at every meal to lose weight. I can have what I want as long as I eat it in moderation. The next time someone tells me "Hey, you can't eat that", I am just going to hold up a sign saying www.myfitnesspal.com!!! Counting calories is one of the easiest "diets" I have ever been on. I can't call it a diet. I haven't deprived myself!!!! Incredible success stories from real people, just like you! "I would shop for the most forgiving clothes possible and sometimes skip events because I didn't feel comfortable in anything I had to wear." "Thanks to MyFitnessPal, I've rolled back 26 years of weight gain and discovered a life I thought was gone forever." "Every pound I lose gives me more confidence, and makes me feel like I can do anything. 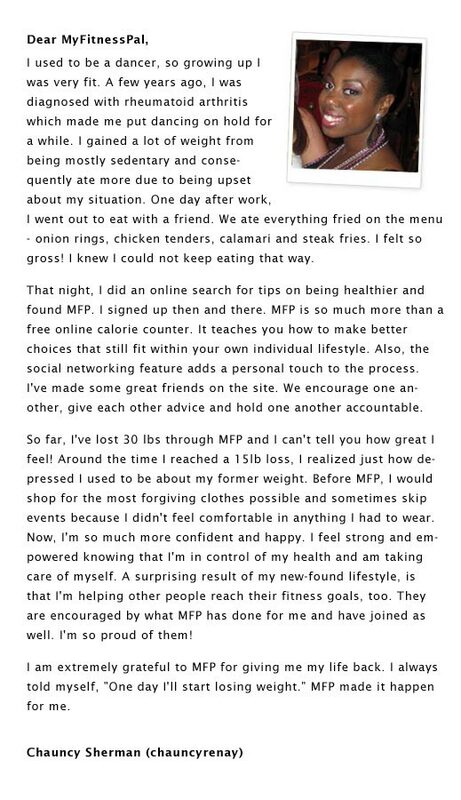 MFP gave me a life back that I truly believed I had lost." "I can honestly say that finding this website has been the best thing to happen to me in my life..."
I think the best thing about introducing people I work with to this user-friendly food tracker is the learning they experience for themselves. Once they start tracking their food, they naturally discover which foods have fewer calories and are better for them...that system is much better than the good ole' directive of "eat this, this, this and this and exercise 1.5 hours a day." MyFitnessPal is a guide, a friend in the path to higher health. 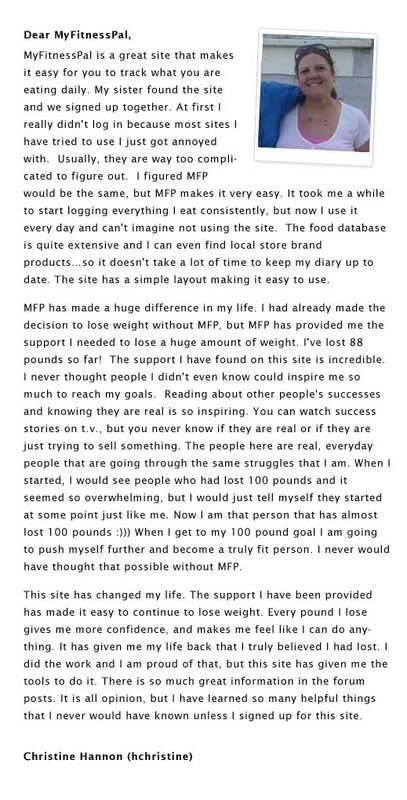 When people discover MFP, they discover so much. It's so exciting to see the successes people are making by adjusting their lives in the smallest but meaningful ways. Thank you for what you are doing here and I will continue to use the site in my life and in the lives of people I work with who are journeying to find the brightest, healthiest them. When I decided I needed to make a difference in my life, I tried a few different methods; keeping a notebook, other online food journals. A friend of mine suggested MyFitnessPal to me and I haven't tried another site since. 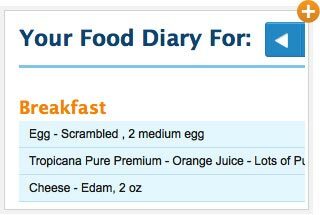 MyFitnessPal keeps me honest about what I eat and how much I eat. I keep my food journal public so I can share what I have learned about rights and wrongs in my day. Still not sure? Watch one of our members featured on the Today Show! Watch an interview from the Today Show with one of our members. Tamara used to weigh 278 pounds, and lost 141 pounds using MyFitnessPal! 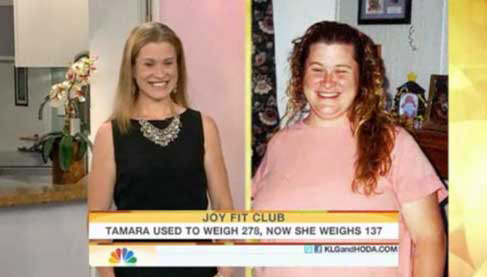 Tamara, a 31 year old mother of two, weighed 278 pounds at her all time high. One busy morning, she got off from work early to celebrate her daughter's birthday. But by the time she got to the party, she was so exhausted that her husband had to handle the party by himself. It was that day that she decided to do something about her weight. 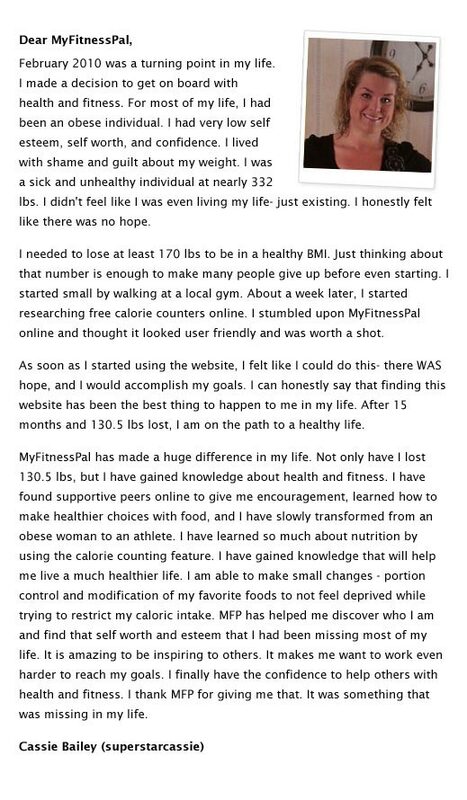 Tamara's friend April asked her to check out MyFitnessPal, and our free app and website helped her lose 141 pounds. Her story is so amazing that she was featured on the Today Show! Watch the video on the right to hear Tamara's story, then change your life and start using MyFitnessPal today. So what are you waiting for? Start Losing Weight for FREE! Remember me next time Forgot password or username?